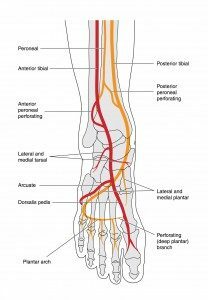 Your podiatric physician can do a simple test to determine if you have peripheral artery disease. The test is called an ABI, which stands for ankle-brachial index. It compares the blood pressure in your ankles with the blood pressure in your arm. If your ABI is abnormal, your podiatric physician may order other tests to determine the extent of your peripheral artery disease. Click here to see how to perform an ABI to check for poor circulation. PAD is short for Peripheral Arterial Disease. PAD is caused by a blockage or narrowing of the arteries in the legs when fatty deposits called plaque build up. The buildup of plaque causes the arteries to harden and narrow, which is called atherosclerosis. This results in a reduction of blood flow to the legs and feet. This is commonly referred to as poor circulation. PAD occurs most often in the arteries in the legs, but it can also affect other arteries that carry blood outside the heart. This includes arteries that go to the aorta, the brain, the arms, the kidneys, and the stomach. When arteries inside the heart are hardened or narrowed, it is called coronary artery disease or cardiovascular disease. People with PAD have a two-to-six times’ greater chance of death from a heart attack or stroke. PAD and diabetes are the leading causes of foot or leg amputations in the United States. PAD can be treated with lifestyle changes, medicines, and surgical procedures if necessary. Since people with PAD are at high risk for heart attacks and stroke, they must take charge of controlling their risk factors related to cardiovascular disease. Surgical Procedures: A variety of surgical treatment options are available depending on the location and severity of the artery blockage. Your podiatric physician can refer you to the appropriate specialist for these procedures. Fatigue, tiredness, or pain in your legs, thighs, or buttocks that always happens when you walk but goes away when you rest. Do not ignore leg pain. It is important to discuss any leg or thigh pain that you are having with your podiatric physician since it could be a warning sign of a serious disease such as PAD.